These things seem to be insanely rugged, as specified in their datasheets. Watch these demos. This is BBI Amps from the US, one of those guys who like to build crazy high power CB amps. Love them or hate them, they are entertaining. And some of them build some beautiful looking amps. This guy builds all sorts of solid state- and valve amps. In this video (starting at 21:40) he is showing the ruggedness of his latest amp using the BLF188XR LDMOS FET. In this video (fun starts at 1:30), the ruggedness of a Freescale MRFE6VP61K25 is demonstrated. It would be interesting to know how much of this can be done before it starts degrading, if ever. I was looking for a TX/RX relay that can work up to at least 100W and 6m. Looking at some construction projects and the relays they use, it looked like you can more or less get away with murder compared to what is required on higher frequencies. 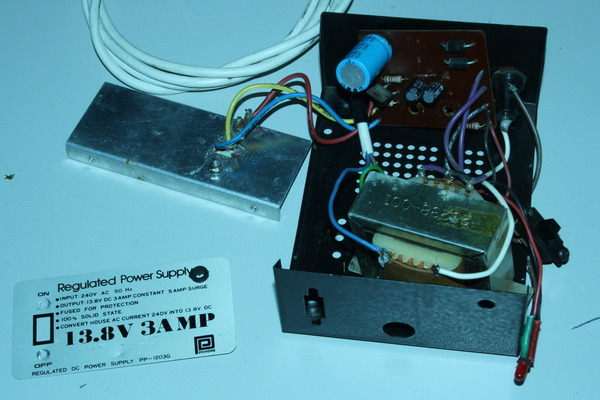 I got this old 13.8V 3A power supply from a junk yard / second hand shop / don’t-know-what years ago. It worked well, but I have some other 12V supplies and need a supply with adjustable output voltage. I have some of my recorded audio files on another server. The idea was to put more on there, but there hasn’t been much opportunity. With the exception of the 2015 file, all of them were recorded in South Africa at Hartebeespoort near Pretoria – locator KG34WG. The one recorded in 2015 was in the UK. File order is a mess. There is a plan, believe it or not. Interesting clip (in Afrikaans) is some hams doing musical tests on 80m (20101015_213134_3748L_musikale-frekwensie_.mp3). This is still legal in SA subject to some strict limitations. This particular group does this on LSB (some of them wideband) and do actually experiment with audio quality. Click here to feed your snap, crackle and pop addiction. The UK Activity Contests are held by the RSGB Contest Committee (www.rsgbcc.org) throughout the month on Tuesdays from 20h00-22h30 local time. First Tuesday of the month is 144MHz, second is 432MHz, third is 1.3GHz and the fourth Tuesday is 50MHz and 13cm to 3cm. I’ve always been interested in 6m, but have never done much about it. I bought a Yaesu FT690 a while ago with a whip antenna (Moonraker MR625) and PL259 magnetic mount for the car. On the evening of the 22nd on the spur of the moment I decided to drive out the Newlands Corner just outside Guildford and listen on 6m. This is at location IO91RF95.